The temple. It's kind of 3D, kind of brain teasure. I've never had the joy of actually stacking it, though. Ladies and Gentlemen, we’ve got a temple to build. Actually, we’d rather not build the temple ourselves, but instead fund the building of the temple. We’ve got ships not construction cranes, at any rate. So unfurl your sails and brush up your influential speeches so you can travel the world to obtain goods and sell them in order to obtain gold and silver. After all, what kind of temple is a temple not built out of precious metals? Have n’Ophir, because here we come. 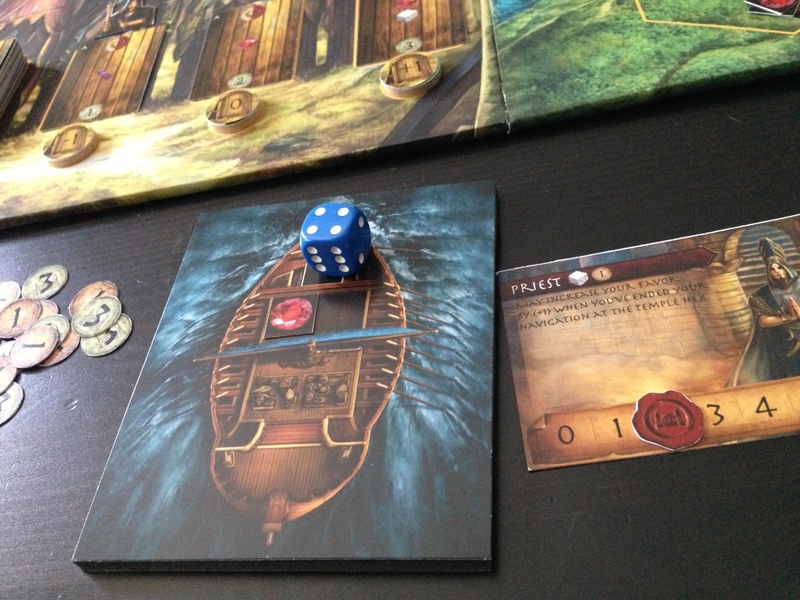 A small disclaimer here; I’ve never actually played Ophir as a board game. I did have the opportunity to sit down with the designers, if by “with” you mean connected through space/time by means of the mysterious technology known as “the internet”, and by “sit down” you mean… well, actually I did sit down. In other words, I played the game online, with no physical components. No art. You might say, no distraction. Or you might say “the least exciting way to play a board game,” but what can ya do. At the very least I was able to spend most of the game changing Jason’s player name to make him more interesting. Seriously, that guy. Anyways, I’ll probably spend a good chunk of this preview trying to remind the designers of the less-than-complete experience they provided and now they owe me a boat. A real one. Okay they know i’m teasing, since I did get to play with them. You know I’m teasing, right, guys? But seriously, where’s my boat? Here’s some art, you happy NOW? Ophir is a light-to-midweight eurogame, which means the focus is on economics over combat, and player efficiency over interaction. Set in a nondescript-but-possibly-Mediterranean “ancient land” players will sail their ships to collect goods, and then trade those goods for money and influence. The ultimate goal is to help build the Temple, which is made out of the finest metals. Each turn players have to move at least one space and up to 2. If they move into a hex with another player, they must roll their “influence” and meet or beat the other player, otherwise they can’t move in! Fortunately, a failed attempt DOES decrease the opponent’s influence. 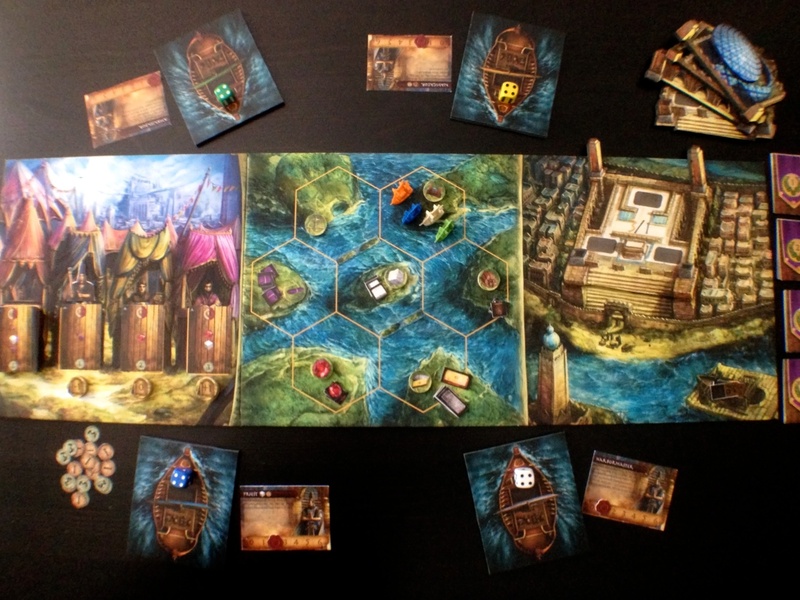 After moving, players get an action – they can grab a good from their location, or sell goods at the Market, or trade goods for Favor at the Temple, or buy Gold and Silver, or deliver that gold and silver to the Temple to score big points. Ships have limited cargo slots – starting with 2, upgradable to 4. Favor can be used to stay in a location on your turn instead of moving, or to move into a hex with an opponent without rolling the die, or in large quantities to trade for gold and silver instead of money. Cool! Also, each player has a special role which is drafted at the start of the game, and provides a unique bonus. Each level of the temple takes 3 blocks of either gold or silver to complete. When a new level is added, the cost of gold and silver goes up. When the final level is complete, the game ends and its time to count scores! I’m not a big fan of kickstarter, at least in regard to board games. I’ve seen a lot of lackluster products, or even good games that lacked the polish they really needed before they got published. Still, I’m not closed off to giving kickstarter games a try, and I hope that kickstarting publishers will continue to learn from the past and make better products. You’re on a boat, i’m on a boat. Boat boat boat. 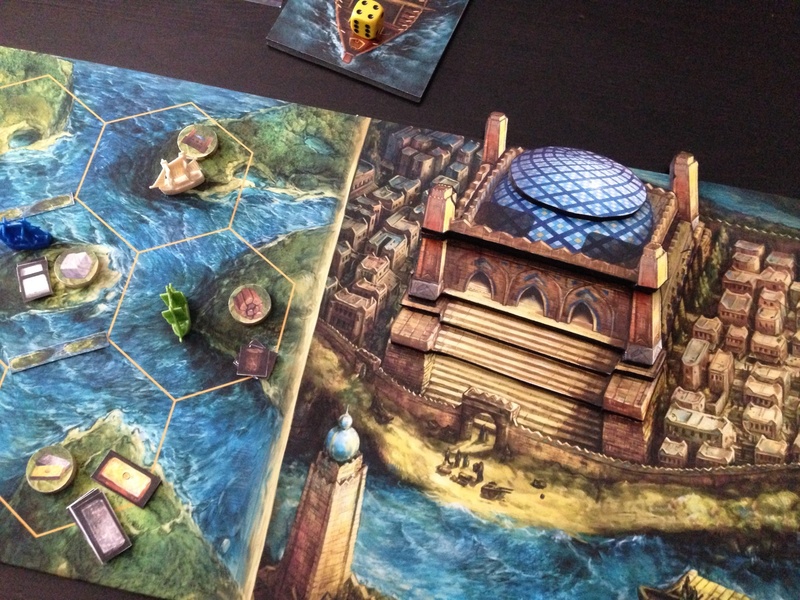 In playing Ophir, despite the lack of actual physical product to toy around with, what left the biggest impression on me was the lack of bloat. I’ve seen so many games pack in powers, abilities, actions, goodies, and all sorts of things to make a game seem more awesome. 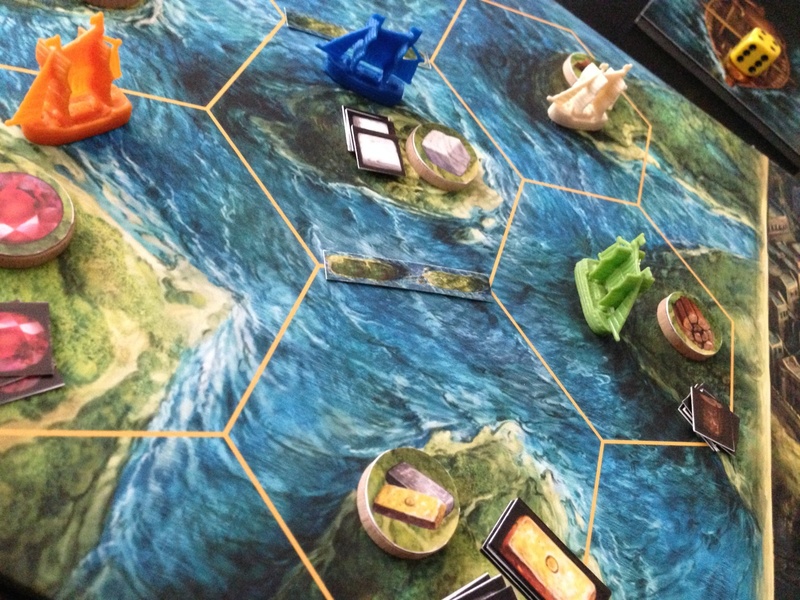 Ophir is a very streamlined game. It is clean, with very few rules to remember. There were only about 8 player abilities, and there are just a few things you need to worry about doing. In a sense, Ophir is essentially a pick-up-and-deliver game, but it’s more of a resource management game using the movement rules to force you to think about how to best get the resources you need. Since you can only get one resource cube at a time, and you have to move each turn, you have to decide how you’re going to navigate the islands and get the resources you need. You COULD spend a favor to stay and grab an extra cube where you are. Then you have to decide again; do you trade goods in for money, or for Favor? Money is ever so useful, but Favor is pretty powerful and widens your choices. The point is, despite the limited rules, you still have a lot of choices. It’s resource management without having to worry about building an efficient engine; you simply must act efficiently. If you screw up early in the game, you don’t have to worry that you destroyed the possibility of the most efficient engine; you can still try to out-guess and out-manuever your opponents for a catchup move later on. You don’t have a thousand resources to manage that all do different things, you have a few resources but limited ways to get them and use them. This may or may not be the game. I wouldn’t know, I’ve never seen it. I like this focus on smaller limits to create choices rather than trying to make a big ol’ world with tons of stuff to manage- it’s a lot more likely, especially with first-time publishers, that the game can be balanced, strategic, and challenging. Add the level of strategy to the beautiful art and the cool stacking temple (which, I unfortunately just have to take their word that it looks like what it does, just like you. At least there are videos and pictures out there, and it would’ve been a prototype anyways), there’s potential here for a really solid entry here into the midweight eurogame arena. This game could be a very accessible entry point for new gamers. I hope the stacking temple turns out as good as it sounds, because those elements will add fun to what seems to be a solid game. However, there are definitely elements of luck to this game. When you roll to move into an opponent’s sphere of influence, rolling well is definitely better than rolling poorly. The benefit is twofold – roll a 6 (like Jason Kingsley – one of the designers – did frequently and often during our game. Suspiciously frequently, if you ask me. Lets just say i’m not sure the die he was using had any other number besides 6 on it) and you’re in, and it will be that much harder for opponents to barge in after you. Roll a 1 (Much like Jason Meyers did all night long, which is good, because I finally found someone WORSE at rolling dice than myself), and not only do you not make the journey, but you aren’t going to be impeding anyone else’s progress anytime soon. The Market can also be a wild card. With 3 players, the market won’t cycle quite as fast, giving you some amount of planning. But with 4 player, the available market cards will cycle quickly and you may be looking at a completely new set of cards from your previous turn. In some cases you may have started pursuing resources that are just no longer available. This randomness does serve to keep the game from becoming “solvable” – with such a simple system, more static markets could lend to experienced players taking complete control of a game. In a more family-oriented, casual game like this the randomness should help to balance out the game for newbies and veterans. Will it start to get frustrating to experienced players? I don’t know. Then again, the most experienced players scored the most points. Was it luck? Was it some insidious form of cheating? Was it skill and experience? Probably a little of all 3. 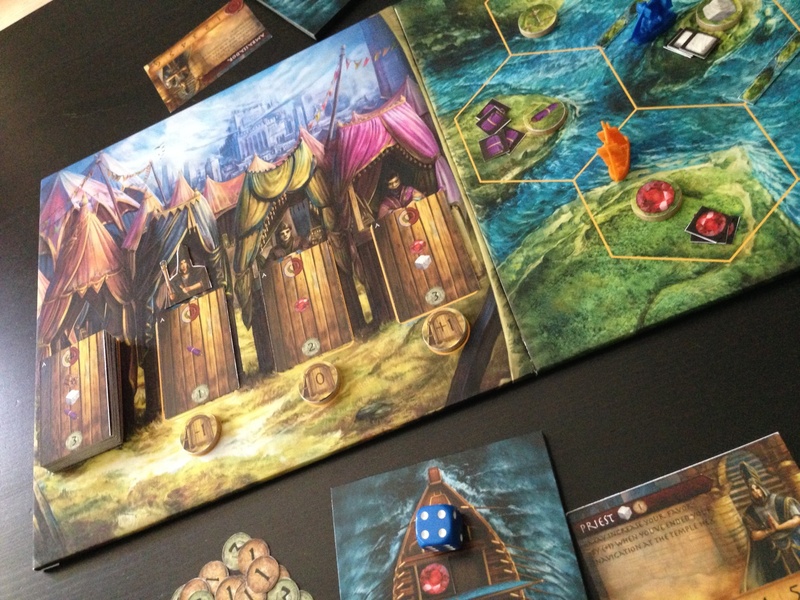 Now, I can’t say whether or not Ophir will be a great game, all said and done. I haven’t been able to explore the game deeply. It’s possible that player powers are imbalanced (at some points it did feel a bit like my power was not as useful over the course of the game as other powers. Like the one Kingsley was using. Now that I think of it, I’m pretty sure he created this game just so he could beat everyone else at it. Well played, Kingsley, well played). It’s possible that there is turn order advantage. It’s possible that the luck of the markets can really skew a game and the influence rolls can frustrate a player. The temple. It’s kind of 3D, kind of brain teasure. I’ve never had the joy of actually stacking it, though. 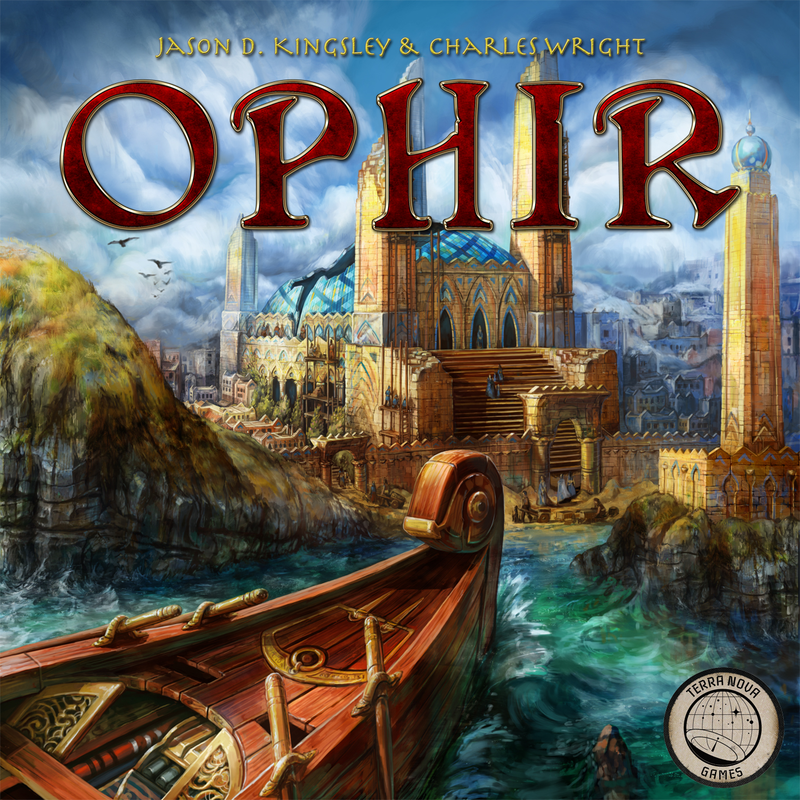 But it seems that Ophir is accomplishing what it set out to do; it’s a streamlined eurogame with a little flair in the components, an accessible game that offers strategic choices but not too much complexity. It may be a little stretch to say that it is “a joy to play for families” AND “for the experienced gamer to savor” but it may well just be a great family game that a gamer can find value in playing. I’m told it clocks in around 45 minutes of playtime, although i can’t verify that since the digital interface was a little clunky and slow (plus we were just learning the game). At the very least, it’s a lighter game that should fit in a lunch hour, yet still scratches the euro-gaming resource management itch. Even myself and dragon Jason enjoyed it, and we’re not in the euro club. Please go check the game out on Kickstarter. It’s beautiful for sure and deserves to be funded as much as any Kickstarter game out there. This preview was paid for by Terra Nova Games.